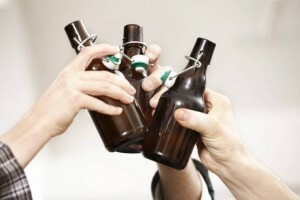 Beer, or any alcohol for, when consumed in moderation, may be a brilliant motivator to keep people working out. Scientists still need to do more research as to exactly what the connection is, but several studies have found that people who drink moderately tend to exercise more than abstainers. There has been a lot of research about the helpful cardiac benefits of drinking in moderation. A daily glass of wine is included in the Mediterranean diet that many doctors recommend to patients as a healthy way to eat. Some studies have even looked at beer as an alternative kind of sports drink (the nutrients in the hops and the sugar can work if sodium is added and the alcohol content is lower). One theory may be that alcohol and exercise both work on the same pathways in the brain. There are a lot of parallels in terms of how the brain responds to exercise and alcohol,” Leasure said. The brain releases dopamine and endorphins with both. “It does make you wonder if people are feeling good when they exercise and people feel good when they have a drink, maybe they continue to seek out that experience. Endorphins – a chemical naturally, released in the brain to reduce pain. 1. Are you a beer drinker? Have you exercised after beer drinking?